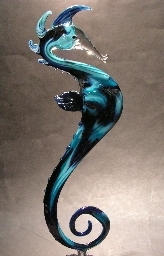 Glass artist/designer Martina Dodson, moved to Maui from Sweden in 1994. In Maui, she began her artistry of flameworking at Maui Crystal Gallery. 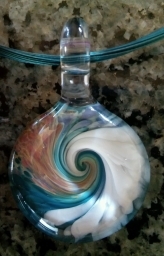 She has been operating her own business, Maui Moon Glass, since 2002. As a true soul surfer, her love for the ocean, surfing, and the magical beautiful surroundings of the Hawaiian islands, reflects directly in her art work. Even her two daughters' names are Ocean and Coral. "To surf in the ocean there is a constant movement and flow. It is the same thing when sculpting glass, you just got to keep moving with the flow"
The glass she uses is the very strong Pyrex (Borosilicate) glass. It is all made free-hand, torch-worked, then annealed, in a kiln without any molds. Each piece is always unique, and has its own character. Her work can be seen at numerous shows, such as the Made in Maui County Festival, Maui's Finest Craft Fair at the Westin KOR, and the Westin Maui Resort & Spa lobby. She has also displayed her glass at different famous galleries, such as Seargent's Fine Jewelry, Martin & MacArthur, Maui Crystal, Kamari (Sweden), and The Heart Store of Sweden. Her work has been published in famous crafts and arts magazines, such as Bead & Button, Lapidary Journal, and The Flow (Annual Women In Glass). Also, Women Surf World Champion, Carissa Moore, loves to wear Martina's art! Click here to se Martina's newest jewelry and sculptural glasswork.